Along with the rewards of brewing, there are many potential pitfalls. Mostly, they result from poor technique or preparation, perils easily avoided. For all of the minutiae learned over the years, my sessions come down to following a few practical and uncompromising ground rules. Here are my 10 commandments of homebrewing. Before attempting to brew, tap into the extensive resources and wisdom available. Brewing books, homebrew clubs, experienced brewers and the Internet all offer invaluable tutelage for novices. Invest in a comprehensive brewing book such as How to Brew by John Palmer. Join the local homebrew club, get to know some wizened brewers and watch a brew session. Don’t be intimidated: We were all beginners once upon a time. Like anything involving craftsmanship and self-expression, brewing will be superior with a solid strategy. Planning well ahead of time offers a chance to tweak and research the style, ingredients or technical considerations, and harmonize each component and its contributions. Notebooks are handy and invaluable. Consistency and creativity are not mutually exclusive. Beer is finicky enough; don’t be feckless. It is natural to assume that more is better (or necessary) to achieve complexity, but often a minimal approach is more prudent. Chefs can create gourmet dishes with a scant few ingredients, and so can brewers create great beers. Classic beers are surprisingly simple, complexity coaxed from each ingredient with skill and attention to detail. Most beers can be made with four or fewer malts and just a couple of hop varieties. Mash temperature, boiling duration and precise timing are as critical as ingredients.Single malt and single hop recipes are the very essence of this approach. Proper, utilitarian hardware is crucial to execution. A good brewer needs only the most basic tools and elbow grease to brew proficiently. If you can’t afford, don’t need or want luxury items, then consider these essential: floating thermometer, hydrometer, autosiphon and balance. Monitoring your brews with a hydrometer from start to finish will raise your brewing awareness greatly. Autosiphons make racking effortless and more sanitary. The balance ensures proper ingredient proportions and better reproducibility. A floating dairy thermometer can be used in the kettle, hot liquor tank, mash tun and fermenter. Mastering ingredients, proportions and synergy is essential to making great beer. This is important whether you are an unwavering beer stylist, a mad scientist or both. Nearly everything has likely been done before, so somewhere there is information about it. Brewing software is an excellent learning tool for freelance or stylistic construction alike. Likewise, picking the brain of a savvy, experienced brewer is a safe bet.Always consider the minimalist aspect of brewing when recipe-building. Every ingredient matters and has a role. The malt and extract options today are vast, making any beer well within the reach of any brewer. Figure in flaked/raw grains and sugars, and wort possibilities are limited only by your imagination. Mashing, magical and enchanting as it is, is elementary and easy to master. Any grain is fair game if prepared and mashed properly. Becoming versed in all things malt—cereal, mashing, saccharification and diastatic potential—puts any grist under your complete control. Never use flaked or raw grains as simple steepers in extract recipes (they won’t convert), and never assume that all specialty malts don’t need diastatic conversion (many do). Besides light, amber and dark barley and wheat malt extracts, brewers now have rye, Munich and sorghum syrups to play with. Scour natural foods, farmers markets and ethnic markets for exotic sugars or honey to fit into your creative or classic recipe. 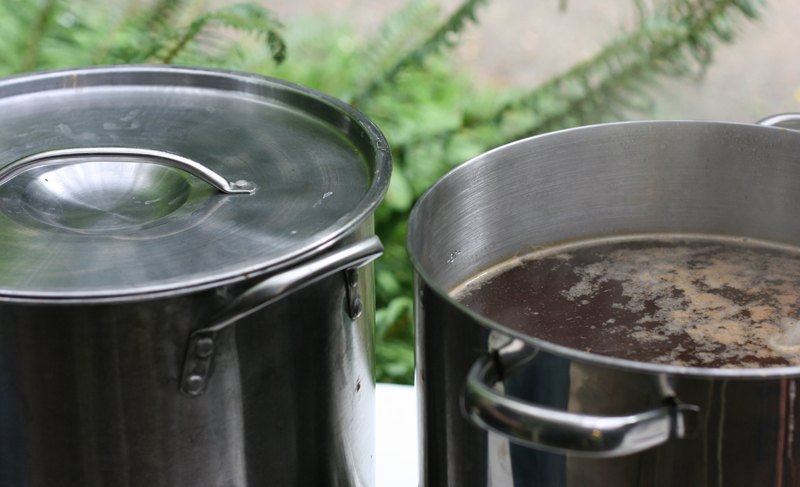 A rolling boil will ensure that your wort enters the fermenter in optimal condition. We are in love with hops, and properly scheduling them is art unto itself. Making hopped brews is more complicated than adding lots of hops often. Likewise, modestly hopped beers can suffer from poor administration, with a narrower margin of error. For hoppy beers, two or three varieties, added at the usual four times (bittering, flavoring, aroma, dry) is a good starting point. Investigate first-wort hopping and hop bursting. Use the noble and traditional cultivars for classic brews: They are never out of style. To calculate usage, settle on one IBU calculator and modify your methods accordingly. Try single-hop brewing. Grow your own. Always store hops properly, cold and well-sealed, as they deteriorate quickly if left to the rigors of oxygen and heat. New hop varieties are being cultivated at a rapid rate worldwide. Have fun experimenting. Yeast is the engine that drives your brew, but a yeast is fastidious about its microenvironment. Respect it and you will be rewarded. Like everything else, yeast options have exploded in the past 30 years. Routine yeast care and use is pretty simple, as long as you play by the rules. Yeasts have a well-defined comfort zone: Too cool, they falter; too warm, they produce unsavory, byproducts. All vendors supply the temperature range in which yeasts function optimally. Conditioning requires the same specific conditions as fermentation for carbonation. Use starters and learn to properly time pitching. Hydrate dried yeast for optimal blastoff. Investigate mixed cultures, Brettanomyces and bacteria. Fermentation will depend primarily on healthy and happy yeast, but there also other considerations. Both glass and plastic vessels have their advantages and disadvantages. Glass can be soaked indefinitely with cleaner (Powdered Brewery Wash [PBW]) and sanitizers (including bleach), but are harder to clean. Use a large offset brush. Plastic buckets are more likely to harbor contaminants, as they can get nicked and scratched, but are easier to clean. Ferment in sync with your ambient conditions, especially if you have a basement, or create them artificially with a fridge or freezer and regulator. Next to sugar, oxygen (via aeration) is the most important yeast nutrient. Racking beer at the proper times will greatly reduce trub carryover at each stage, especially critical when bottling or kegging. Ensure full sedimentation before kegging or conditioning. Perhaps the most frustrating brewing faux pas is infection, especially a systemic one. The best way to avoid this aggravating situation is to keep your apparatus clean. Clean everything immediately after use, before any residue can dry. Sanitation will be immensely more effective and easy with clean equipment. Keep a couple of different-sized brushes handy. Don’t assume that all sanitizers can be used in all situations. Iodine (iodophor) will work on nearly any surface, is no-rinse, and contact time is brief. Star San is similarly handy, but precipitates (rendered ineffective) in hard water. Bleach is effective for impervious and inert surfaces (glass), but should never come in prolonged contact with stainless steel. Always keep your hands clean and keep a spray bottle of rubbing alcohol or 70 percent ethanol handy. Remove dried-on grunge on carboys with a warm soak of PBW. Kegs may need disassembly for cleaning or to have suspect parts replaced. Use your CO2 tank and tap to flush with sanitizer to keep kegs of detritus and contaminants. Rinse bottles immediately after use, and air-dry. Inspect each one before use and send any with visible crud or contamination to the recycling bin. Very interesting article for me. It helps to keep learning how to brew.